After cropping my videos to a 16:9 format using the previously mentioned How to crop a 4:3 video to 16:9 with Windows Movie Maker tutorial, I was left with a puzzling problem. 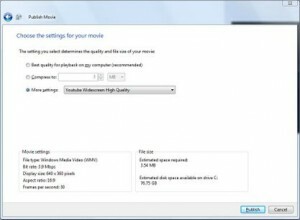 Since Youtube disregards pixel aspect ratio (PAR), and widescreen DVD resolution files do no have square pixels, the only option was to encode the movies in HD 720p. Now this is great if you are dealing with HD video, but then why did you want to crop it in the first place. It is a waste of file space and bandwidth to use an HD output format on an SD video. So, I set out to create some custom output profiles for Windows Movie Maker. To truly create custom profiles, you must download the full Windows Media Encoder software [link]. This includes a tool for creating custom profiles, called Windows Media Profile Editor. With this tool, you can create many different output profiles, several of which will not even be compatible with Movie Maker. After creating the profile, you save it as a “prx” file. This file is actually a simple xml file, that Movie Maker uses to create custom profiles. So to make things easier for you, I will just supply you with two simple prx files. exactly how the files work. You can also edit the files if you so choose. them in your ‘Documents’ folder. exit. Go ahead and open this folder. of Vista’s fussiness about doing so. Now you are all ready to become a YouTube star! So sorry about that. Somehow those links dissapeared! They are back now.